Risk Identification considering symptoms, tasks and hazards. 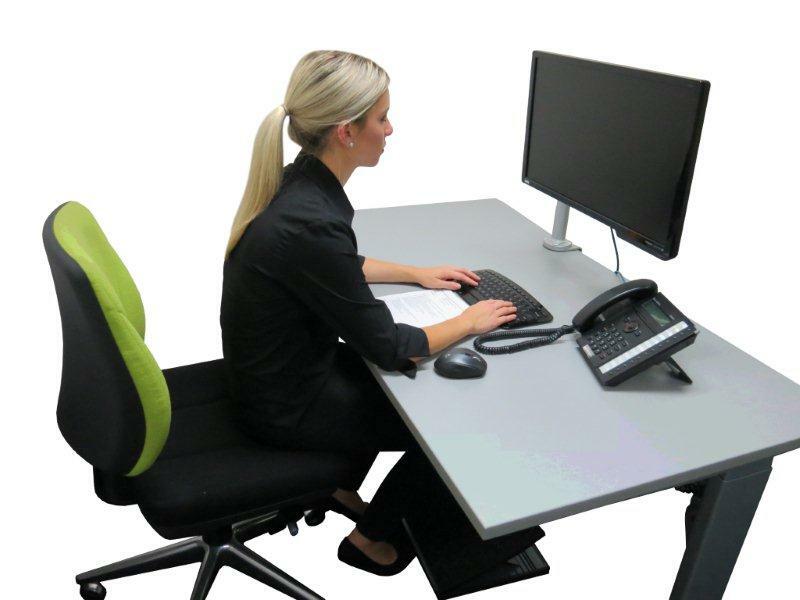 Ergonomic Assessment of work posture and equipment. Ergonomic Office Adjustment of current equipment. Office Ergonomics Action Plan including recommendations and prescription of ergonomic equipment (if unavailable internally). Ergonomic Training and Ergonomic Resources including postural training, stretching education and handouts. Ergonomic Equipment Supply (if required). Optional Follow-up re-assessments for symptomatic people or to adjust new equipment (especially chairs). As our physiotherapists are all multi-skilled in the field of ergonomics and musculoskeletal treatment of office workers, they are able to better understand an employee’s aches and pains, and customise ergonomic office assessments and adjustments to reduce injury risk factors. Quick Check and Adjust Assessment 15 mins Includes very brief assessment, adjustment of existing equipment, very limited staff education, 1 page report. Recommended with the comprehensive group seminar. Comprehensive Assessment 35 mins Includes assessment, adjustment of existing equipment, concise staff education, 3 page report and up to 3 customised handouts. The comprehensive assessment is our most popular ergonomic service and is recommended for anyone experiencing symptoms of pain or discomfort. Thorough Assessment 45-60 mins Includes thorough assessment, adjustment of existing equipment, thorough staff education, 3-6 page report and up to 3 customised handouts. Suitable for staff with long term, acute or chronic pain conditions. Re-Assessment 10 mins Re-adjustment of equipment once it has been supplied. Brief Ergonomic Seminar 45 mins Includes interactive PowerPoint presentation covering key ergonomic education principles, stretches, use of props (e.g. spine). Recommended maximum of 15 attendees to maintain interaction. Comprehensive Ergonomic Seminar 60+ mins Includes more detailed interactive PowerPoint presentation covering key ergonomic education principles, stretches, questions answered, props used (e.g. spine). Recommended maximum of 15 attendees to maintain interaction. “Ergosmart” Online Ergonomic Assessment 25-30 mins The online program graphically guides the user to assess their workstation and steps them though making adjustments to layout and equipment. If employee health and safety is compromised we source and prescribe quality equipment, customised to individual requirements, to avoid the risk of sourcing incorrect equipment.